So I can't help but theorizing on how things are going for each of the armies I have collected. With each new day brings more information that seems to be falling in the 'confirmed' catagory. Each tidbit fills in the gaps of knowledge but there are still plenty of things that are unknown. Some things are clearly not going to resolved until the FAQs for the armies are put out hopefully VERY shortly after launch. Even beyond that, it is going to take many games to see what's what. But still it is fun to theorize. So I'll start with my orks and the build I've been using, which I'd say has been my main competitive army for 5th edition. First the biggest unknown here for me is how the waagh will actually work. If it is simply fleet (which is now reroll the 2d6 assault) that is not so bad as a stand alone. But when we take into account that vehicles can only move 6" and deploy guys who then take their normal move... I get a little worried. Currently boys in a battlewagon move 13" (red paint)+ 2" deploy + D6 Waagh fleet+ 6" Assault. That's a 22-27" assault. Now we'd be talking about 7" battlewagon move+ 6" deploy/move + 2d6 Assault with reroll. That means the max assault is 25" but the minimum is 15". That is a little frightening. Granted you hope with the reroll you are getting into 20" assaults most of the time but that still just feels 'slow' to me. 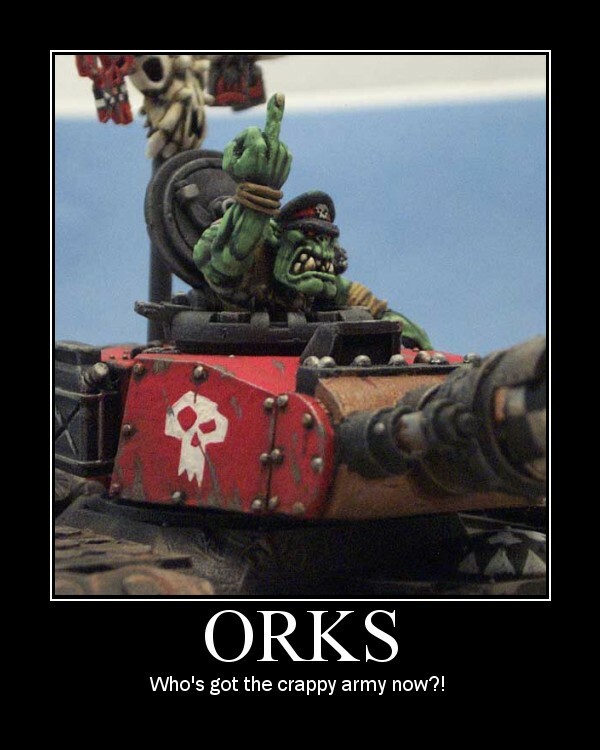 But then what about Ghaz, Slow and Purposeful, and his Waagh (3d6 assault with reroll? Maybe auto 12" assault)? Things could go really bad (min 10" assault, ouch!)... so I am dying to see how this plays out over the next week. Granted Ghaz is still a beast in CC and with challenges things could be pretty freakn aweseome. Beyond that the KFF mek is now notably not as good at keeping vehicles alive. He's still cheap at 85 points at a 5+ is still better than nothing for an amry that needs to get across the board. Lootas look to be better than ever really. Volume of fire and hull points are going to be their bread and butter. Nothing too new there. Snikrot doesn't seem to have too many changes. Challenges may hurt him but he is pretty easy to place in favorable positions so I'll keep the verdict out on this one. Manz are better since PWs don't cut through 2+ armor. I've thought about Mad Doc a little more but while PWs did hurt Manz before wound allocation helped. However it was always the fist that kill them dead so still no FNP for that. 5++ invul is always nice but not getting to chose where you go (and the fact that the BW will not get you as far) is a problem. And that brings us to boyz. 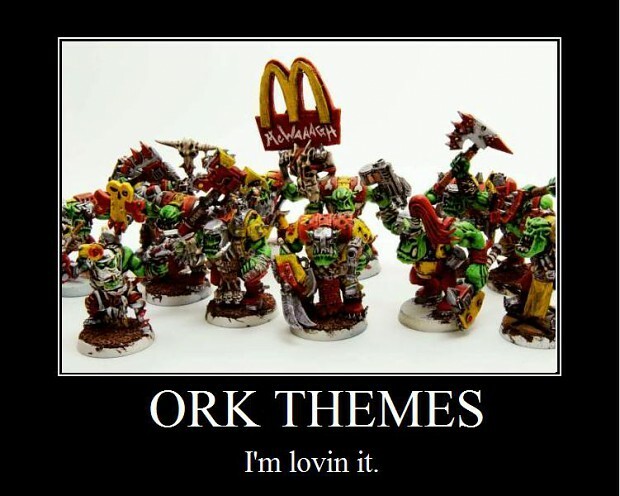 I think first off orks we'll be paying for evy armor for the nobs now. Beyond that I'm worried about the fact that models in CC are removed closest to the action, and consolidation is only 3" at Initiative. This brings me back to the dreaded 'killbox' of 4th edition, though with consolidation at Init some boyz will certainly fill in the ranks I hope. Certainly spreading out too far is going to be a problem. Beyond that regular boyz basically look like they are getting no save in CC. Not that the 6+ was much but it did keep a few boys in the fight. I've always loved ard boyz, but you can only take one squad. The removal of fearless saves is a big boon though. I am also interested in seeing how the multiple charges lose the bonus attack works. I often use that with my big squads of boyz. So we'll see how troops might need to be reconfigured. Buggies are 2 hull points. They usually get destroyed outright but I guess it makes bolters have a better chance of wrecking them. Kans... eh I don't know. Vehicles in general seem to have lost durability and the KFF is weaker so... these may now be worse. We'll see if the squadron rule helps. And lastly for my armies is at last the Battlewagon. We'll have to see how the 4 hull points works out and if there are other rules we haven't seen that help them out at all. The 6" move to deploy guys seems like a huge hit. Is paying 130+ points worth getting essentially 6-12" in two turns? Obviously it is early to say, but of all my armies I think orks might need the biggest reconfiguration from what I've been running. Stormboyz might now be worth it. Will Dreads be counted as scoring troops? Will cheap artillery be worth it? How badly is not having anti psy (beside the default 6+ it would seem) going to hurt the green skins? I have a feeling of the 7 armies I own the orks may need the most reconfiguring of them all.